Ever wonder what took place on Daniel Island before the present-day settlers arrived? Look for the signs! 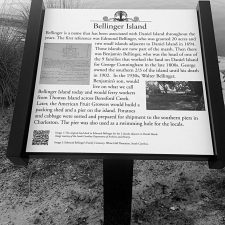 Thanks to the Daniel Island Historical Society, there are now markers in place along bike and walking trails, and in other locations, to document our island history. The signs also feature “QR” codes, which allow smartphone users to quickly scan a symbol on the sign to access more information via our website.